Health literacy refers to the set of skills needed to read, understand, and act on basic health care information. Over 90 million adults with low health literacy skills (see box below) have limited ability to read and understand the instructions contained on prescriptions or medicine bottles, appointment slips, informed consent documents, insurance forms, and health educational materials. Poor health literacy skills have profound economic consequences. Using data from a nationally representative sample of the U.S. adult population age 16 and older, the National Academy on an Aging Society examined the impact of literacy on the use of health care services. The study found that people with low health literacy skills use more health care services. Among adults who stayed overnight in a hospital in 1994, those with low health literacy skills averaged 6 percent more hospital visits, and stayed in the hospital nearly 2 days longer than adults with higher health literacy skills. Among adults with at least one doctor visit in 1994, those with low health literacy skills had on average one more doctor visit than adults with higher health literacy skills. When self-reported health status is taken into account, patients with low health literacy skills had fewer doctor visits but used substantially more hospital resources. Overall, the study found that the primary source of higher health care expenditures for persons with low health literacy skills is longer hospital stays. Other factors, such as the ineffective use of prescriptions or misunderstandings about treatment plans may also have financial consequences. 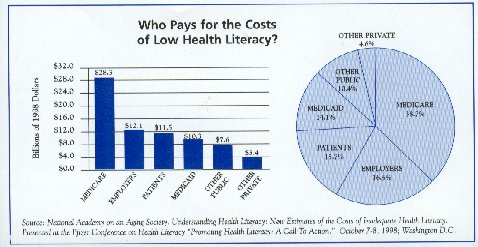 The estimated additional health care expenditures due to low health literacy skills are about $73 billion in 1998 health care dollars. This includes an estimated $30 billion for the population that is functionally illiterate plus $43 billion for the population that is marginally literate. This amount is about what Medicare is expected to pay to finance physician services, dental services, home health care, prescription drugs, and nursing home care combined. While a significant share of the health care costs fall on the patients with low health literacy skills, health care providers and those that finance those providers share the burden. Medicare pays 39 percent of the expenditures. Most of the additional expenditure is financed through FICA taxes on workers. Employers may be financing as much as 17 percent of the additional health care expenditures due to low health literacy skills. Out-of-pocket expenditures by patients total more than $11 billion dollars or 16 percent of the additional health care expenditures. Medicaid pays more than $10 billion dollars, or 14 percent of the additional health care expenditures. 1.Source: Kirsch IS, Jungebut A. Jenkins, L. Kolstad, A. Adult Literacy in America: A First Look at the Results of the National Adult Literacy Survey. Washington, DC: Department of Education 1993.